The Sherman Minton Bridge is a two-deck, two-span steel through-arch bridge that carries Interstate I-64 across the Ohio River west of Louisville. 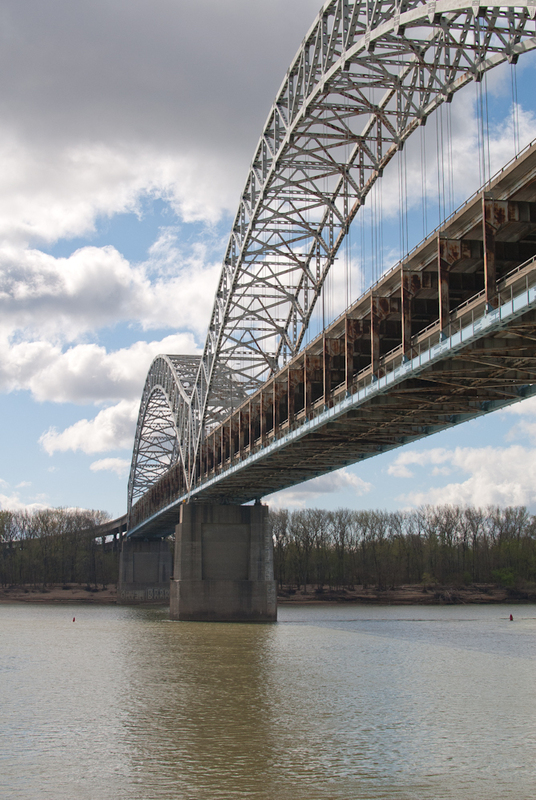 Completed in 1962, the bridge dramatically improved automobile transportation between New Albany and Louisville. As of 2014, it carried about 80,000 vehicles daily. 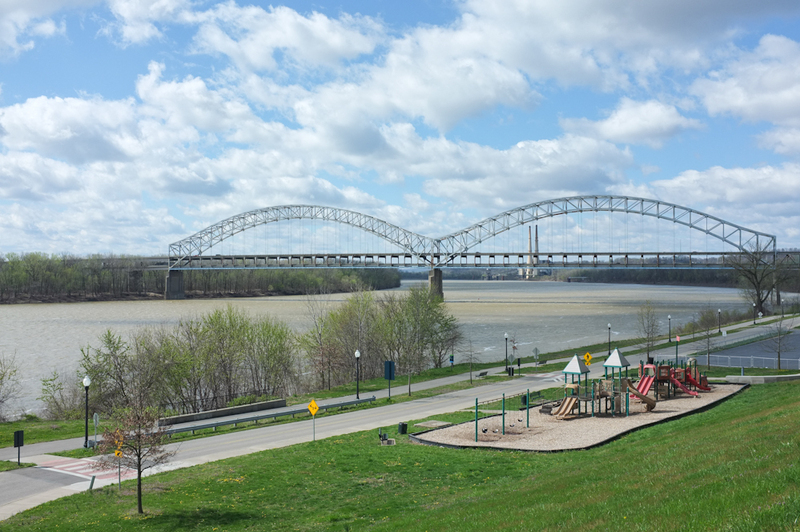 The bridge is named for southern Indiana native Sherman Minton, who rose from humble beginnings to become a U.S. Supreme Court Justice and close friend of President Harry S. Truman. 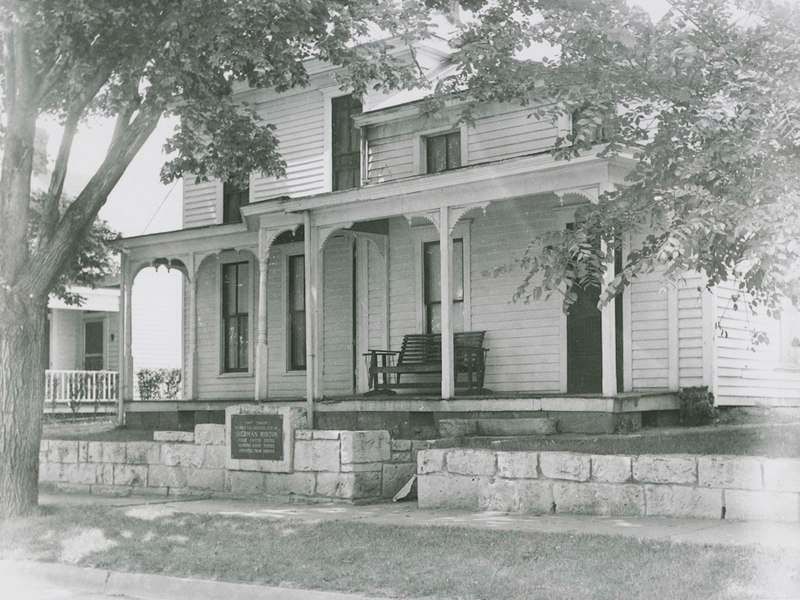 Born in 1890 in Georgetown, Minton attended Indiana University and earned a Master of Laws (LL.M.) at the Yale School of Law in 1916. He served as a captain in the U.S. Army during World War I and won election to the United States Senate as a Democrat in 1934. During his Congressional career, Milton became a strong supporter of the New Deal. 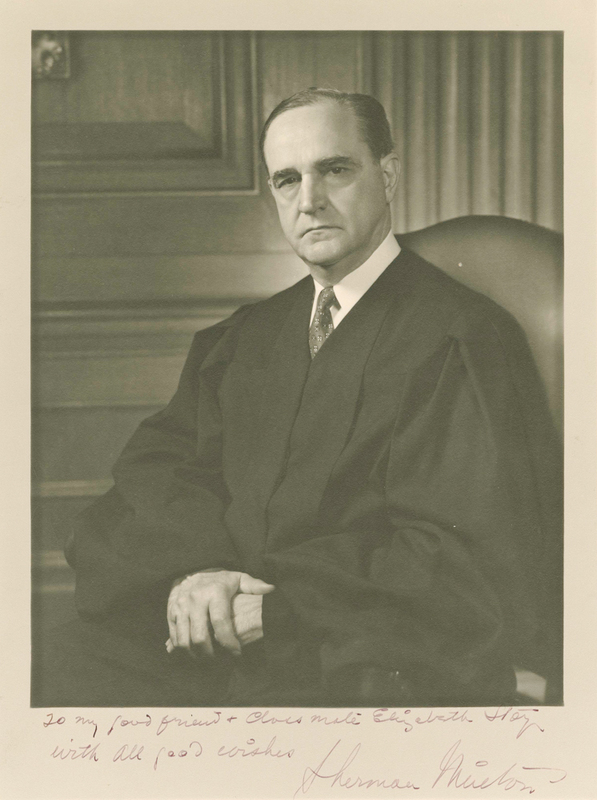 In 1941, President Franklin Delano Roosevelt appointed Minton to the Court of Appeals for the Seventh Circuit. Eight years later, President Truman nominated Minton to the United States Supreme Court. Minton ruled on important civil rights cases, including Brown v. Board of Education in 1954. Poor health prompted his resignation from the court in October 1956. He returned to New Albany and died April 9, 1965, at the age of seventy-five. 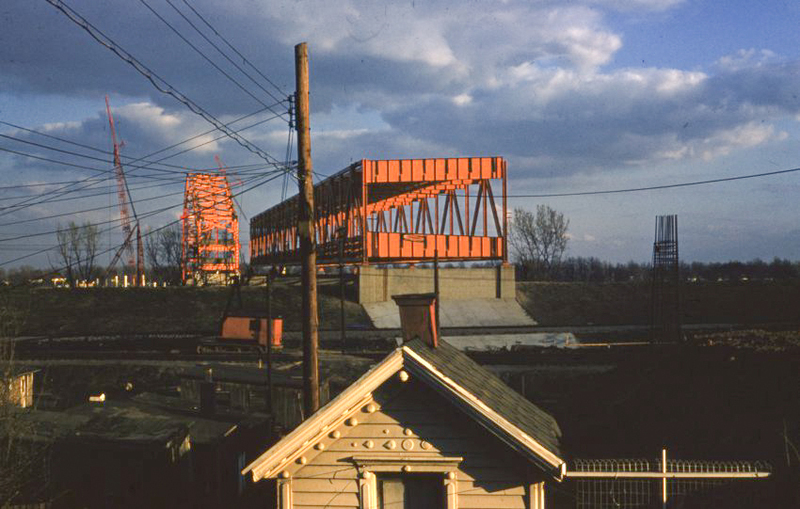 State and federal officials began planning construction of a bridge across the Ohio in the mid-1950s. Hazelet and Erdal, an engineering firm based in Louisville, supplied the design. The firm chose a double-decker configuration because of the terrain on the Kentucky side of the river. Two crescent-shaped arches carry the weight of the two bridge decks, which are supported by 2.5” galvanized strand cables. The top of the bridge is more than 250 feet above the river. Construction began in 1959 and cost a total of $14.8 million. Traffic began moving across the bridge in September 1962. 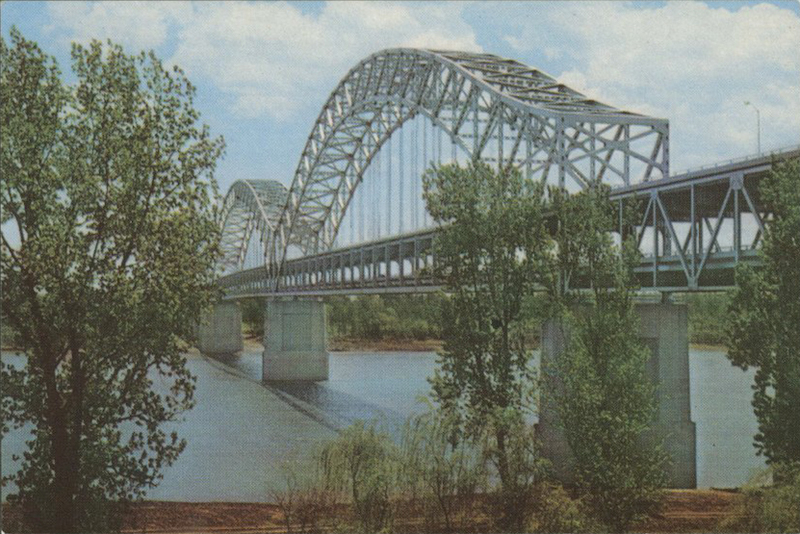 In December, Indiana Governor Matthew E. Welsh named the bridge for Minton, one of southern Indiana’s favorite sons. Construction of the bridge dramatically altered the landscape on both sides of the river. On the Kentucky side, officials managed to cross a floodwall and leave the Shawnee Golf Course intact. In New Albany, the state of Indiana acquired 118 parcels of property to make way for abutments and new roads.In 1997, highway officials carried out a $4.8 million improvement project intended to keep the bridge in service for another ten years. Both decks were resurfaced and workers also reinforced the superstructure. 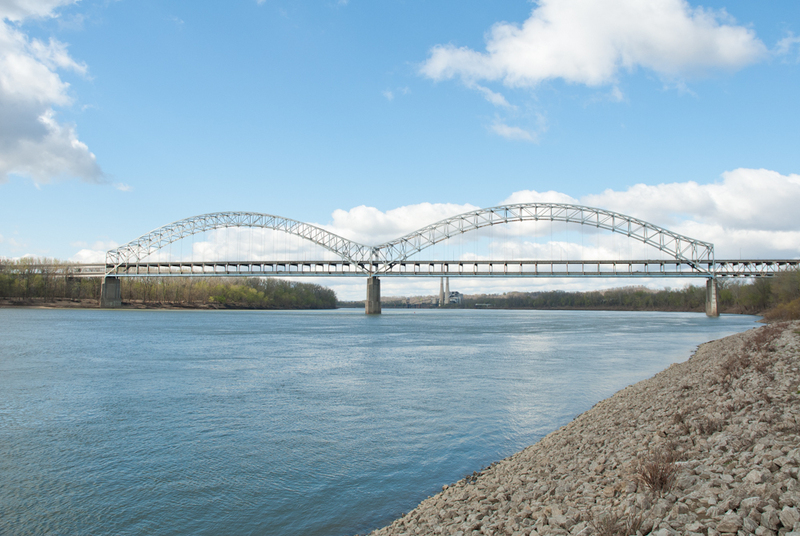 In September 2011, officials abruptly closed the bridge after discovering a crack in a critical location. State and federal officials scrambled to devise a repair plan while commuters familiarized them with other routes. Hall Contracting of Louisville made repairs by attaching steel plates along beams below the lower deck to reinforce the main load-bearing members. The project cost $14 million. The bridge reopened on February 21, 2012. 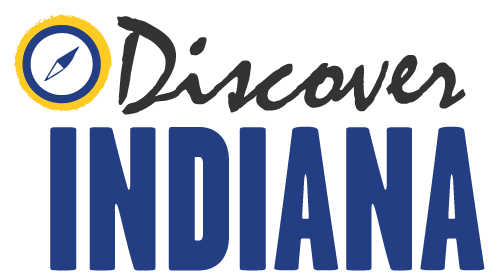 Ashley Slavey, Megan Simms, Wes Cunningham, Eric Brumfield, and Katy Morrison, “Sherman Minton Bridge,” Discover Indiana, accessed April 25, 2019, https://publichistory.iupui.edu/items/show/152. Clare Cushman, ed., The Supreme Court Justices: Illustrated Biographies, 1789-2012 (Los Angeles: CQ Press, 2012), 394-398.“New Bridge Here to Open Dec. 22,” New Albany Tribune, Dec. 5, 1961, p. 1.Gordon Englehart, “New Albany-Louisville I-64 Span Will be ‘Sherman Minton’ Bridge,” Courier-Journal, May 5, 1962.“All Decked Up for Travel.” Courier-Journal Sunday Magazine, Sept. 9, 1962, pp. 12-14.Anthony K. R. Gibson, “All Lanes on Sherman Minton to be Open by Tomorrow,” Courier-Journal, Nov. 18, 1997.Marcus Green, “Cracks Spotted Earlier,” Courier-Journal, Sept. 13, 2011, A1, A5.Joseph Lord and Ben Zion Hershberg, “Reopened Bridge Means a Much Easier Commute for Many,” Courier-Journal, Feb. 21, 2012, A1, A6. Published on May 4, 2016. Last updated on Apr 2, 2019.